BUMPY has a team of dedicated, experienced On-road Instructors who aim to give you the best, safest and most comprehensive training to get you riding on the road. Compulsory Basic Training (CBT) courses are the first step in on-road riding. They allow you to ride a 50cc moped or scooter (at age 16) or up to 125cc scooter or bike (over 17’s only) on the road, and the CBT is the first stage in gaining your full motorbike licence. We run CBT courses 7 days a week. Courses normally start at 8.30am and last one full day. We provide bikes and scooters, and we can loan you a helmet and gloves if you haven’t got your own yet. Please note: The CBT course is about teaching you what you need to know to be safe on the roads, not how to ride a bike. If you do not reach the satisfactory level of achievement then you may have to come back to complete your CBT at an additional expense to yourself. If you have never ridden a bike before, you may find it helpful to take a basic riding lesson before you sit the CBT course. It is essential that you obtain and understand an up to date copy of The Highway Code and have a VALID Provisional or Full Driving Licence. Failure to provide your licence or your knowledge of the Highway Code is not enough, then your CBT will not go ahead and you will have to re book at an additional expense to yourself. When you complete compulsory basic training (CBT) to at least the minimum standard, you’ll get a certificate of completion – also called a DL196. 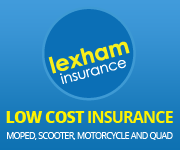 Your certificate of completion lets you ride a moped or a motorbike up to 125cc on the road with L plates for 2 years. You are not allowed to carry pillion passengers or travel on Motorways. If you haven’t passed your full motorcycle test in 2 years, you will need to take the CBT again. The certificate of completion is a legal document. It proves your right to ride as a provisional rider. You may be asked to produce it by the Police. If you lose your certificate, you will need to contact us for a replacement for which you will have to pay for.